Hey pizza lovers - have we got a party-perfect appetizer for you! 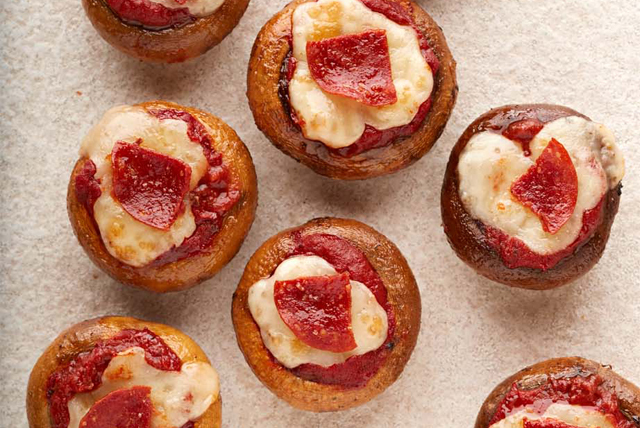 These Pepperoni Pizza-Stuffed Mushrooms combine your favourite pizza toppings for a quick and easy stuffing for baked mushrooms. Yum! Place wire rack on foil-covered rimmed baking sheet; place mushrooms, cap sides up, on rack. Bake 15 min. Drain mushrooms on paper towel-covered plate. Remove wire rack and discard foil (with mushroom liquid) from baking sheet. Return mushrooms to baking sheet (without rack). Spoon pizza sauce into mushrooms; top with cheese and pepperoni. Bake 10 min. or until heated through. Mushrooms can be stuffed ahead of time. Refrigerate up to 4 hours. When ready to serve, bake mushrooms as directed, increasing the final baking time, if needed, until mushrooms are heated through.